A microporous material is a material containing pores with diameters less than 2 nm. Examples of microporous materials include zeolites and metal-organic frameworks. 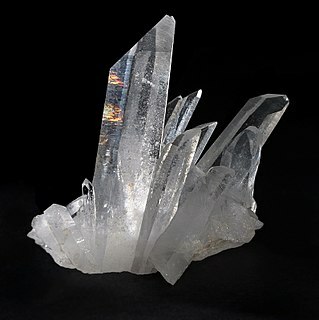 Aluminosilicate minerals are minerals composed of aluminium, silicon, and oxygen, plus countercations. They are a major component of kaolin and other clay minerals. Analcime or analcite (from the Greek analkimos - "weak") is a white, gray, or colorless tectosilicate mineral. Analcime consists of hydrated sodium aluminium silicate in cubic crystalline form. Its chemical formula is NaAlSi2O6·H2O. Minor amounts of potassium and calcium substitute for sodium. A silver-bearing synthetic variety also exists (Ag-analcite). Chabazite is a tectosilicate mineral of the zeolite group, closely related to gmelinite, with formula (Ca,Na2,K2,Mg)Al2Si4O12·6H2O. Recognized varieties include Chabazite-Ca, Chabazite-K, Chabazite-Na, and Chabazite-Sr, depending on the prominence of the indicated cation. Clinoptilolite is a natural zeolite comprising a microporous arrangement of silica and alumina tetrahedra. It has the complex formula: (Na,K,Ca)2-3Al3(Al,Si)2Si13O36·12H2O. It forms as white to reddish tabular monoclinic tectosilicate crystals with a Mohs hardness of 3.5 to 4 and a specific gravity of 2.1 to 2.2. It commonly occurs as a devitrification product of volcanic glass shards in tuff and as vesicle fillings in basalts, andesites and rhyolites. It was described in 1969 from an occurrence in Owl Canyon, San Bernardino County, California. Volcanic ash consists of fragments of pulverized rock, minerals and volcanic glass, created during volcanic eruptions and measuring less than 2 mm (0.079 inches) in diameter. The term volcanic ash is also often loosely used to refer to all explosive eruption products, including particles larger than 2 mm. Volcanic ash is formed during explosive volcanic eruptions when dissolved gases in magma expand and escape violently into the atmosphere. The force of the escaping gas shatters the magma and propels it into the atmosphere where it solidifies into fragments of volcanic rock and glass. Ash is also produced when magma comes into contact with water during phreatomagmatic eruptions, causing the water to explosively flash to steam leading to shattering of magma. Once in the air, ash is transported by wind up to thousands of kilometers away. Zeolites are the aluminosilicate(AlO4 5- and SiO4 4-) members of the family of microporous solids known as "molecular sieves", and mainly consist of Si, Al, O, and metals including Ti, Sn, Zn, and so on. The term molecular sieve refers to a particular property of these materials, i.e., the ability to selectively sort molecules based primarily on a size exclusion process. This is due to a very regular pore structure of molecular dimensions. The maximum size of the molecular or ionic species that can enter the pores of a zeolite is controlled by the dimensions of the channels. These are conventionally defined by the ring size of the aperture, where, for example, the term "8-ring" refers to a closed loop that is built from eight tetrahedrally coordinated silicon (or aluminium) atoms and 8 oxygen atoms. These rings are not always perfectly symmetrical due to a variety of causes, including strain induced by the bonding between units that are needed to produce the overall structure, or coordination of some of the oxygen atoms of the rings to cations within the structure. Therefore, the pores in many zeolites are not cylindrical. A molecular sieve is a material with pores of uniform size. These pore diameters are similar in size to small molecules, and thus large molecules cannot enter or be adsorbed, while smaller molecules can. As a mixture of molecules migrate through the stationary bed of porous, semi-solid substance referred to as a sieve, the components of highest molecular weight leave the bed first, followed by successively smaller molecules. Some molecular sieves are used in chromatography, a separation technique that sorts molecules based on their size. Other molecular sieves are used as desiccants. Cowlesite → levyne–offretite → analcime → thomsonite–mesolite-scolecite → chabazite → calcite. Synthetic zeolites hold some key advantages over their natural analogues. The synthetic materials are manufactured in a uniform, phase-pure state. It is also possible to produce zeolite structures that do not appear in nature. Zeolite A is a well-known example. Since the principal raw materials used to manufacture zeolites are silica and alumina, which are among the most abundant mineral components on earth, the potential to supply zeolites is virtually unlimited. Conventional open-pit mining techniques are used to mine natural zeolites. The overburden is removed to allow access to the ore. The ore may be blasted or stripped for processing by using tractors equipped with ripper blades and front-end loaders. In processing, the ore is crushed, dried, and milled. The milled ore may be air-classified as to particle size and shipped in bags or bulk. The crushed product may be screened to remove fine material when a granular product is required, and some pelletized products are produced from fine material. There are over 200 synthetic zeolites that have been synthesized by a process of slow crystallization of a silica-alumina gel in the presence of alkalis and organic templates. Many more such structures could theoretically be made. In addition to variations in structures, zeolites can also be made with a variety of other atoms in them to make them chemically interesting and active. Some examples of the so-called heteroatoms that have been incorporated include germanium, iron, gallium, boron, zinc, tin, and titanium. One of the important processes used to carry out zeolite synthesis is sol-gel processing. The product properties depend on reaction mixture composition, pH of the system, operating temperature, pre-reaction 'seeding' time, reaction time as well as the templates used. In sol-gel process, other elements (metals, metal oxides) can be easily incorporated. The silicalite sol formed by the hydrothermal method is very stable. The ease of scaling up this process makes it a favorite route for zeolite synthesis. 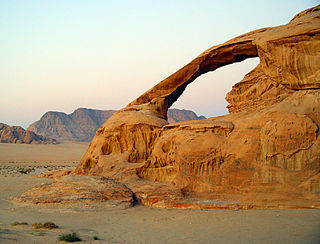 Computer calculations have predicted that millions of hypothetical zeolite structures are possible. However, only 232 of these structures have been discovered and synthesized so far, so many zeolite scientists question why only this small fraction of possibilities are being observed. This problem is often referred to as "the bottleneck problem". Currently there are a number of theories attempting to explain the reasoning behind this question. Zeolite synthesis research has primarily been concentrating on hydrothermal methods; however, new zeolites may be synthesized using alternative methods. Synthesis methods that have started to gain use include: microwave-assisted, post-synthetic modification, steam. Geometric computer simulations have shown that the discovered zeolite frameworks possess a behaviour known as "the flexibility window". This shows that there is a range in which the zeolite structure is "flexible" and can be compressed but retain the framework structure. It is suggested that if a framework does not possess this property then it cannot be feasibly synthesised. As zeolites are metastable, certain frameworks may be inaccessible as nucleation cannot occur because more stable and energetically favourable zeolites will form. Post-synthetic modification has been used to combat this issue with the ADOR method,  whereby frameworks can be cut apart into layers and bonded back together by either removing silica bonds or including them. Zeolites have the potential of providing precise and specific separation of gases, including the removal of H2O, CO2 and SO2 from low-grade natural gas streams. Other separations include noble gases, N2, O2, freon and formaldehyde. Synthetic zeolites, as other mesoporous materials (e.g. MCM-41), are widely used as catalysts in the petrochemical industry, for instance in fluid catalytic cracking and hydrocracking. Zeolites confine molecules in small spaces, which causes changes in their structure and reactivity. The acidic forms of zeolites prepared are often powerful solid-state solid acids, facilitating a host of acid-catalyzed reactions, such as isomerisation, alkylation, and cracking. Catalytic cracking uses reactor and a regenerator. Feed is injected onto hot, fluidized catalyst where large gasoil molecules are broken into smaller gasoline molecules and olefins. The vapor-phase products are separated from the catalyst and distilled into various products. The catalyst is circulated to a regenerator where air is used to burn coke off the surface of the catalyst that was formed as a byproduct in the cracking process. The hot regenerated catalyst is then circulated back to the reactor to complete its cycle. The German group Fraunhofer e.V. announced that they had developed a zeolite substance for use in the biogas industry for long-term storage of energy at a density 4x more than water. Ultimately, the goal is to be able to store heat both in industrial installations and in small combined heat and power plants such as those used in larger residential buildings. Non-clumping cat litter is often made of zeolite or diatomite. Synthetic zeolites are used as an additive in the production process of warm mix asphalt concrete. The development of this application started in Germany in the 1990s. They help by decreasing the temperature level during manufacture and laying of asphalt concrete, resulting in lower consumption of fossil fuels, thus releasing less carbon dioxide, aerosols, and vapours. The use of synthetic zeolites in hot mixed asphalt leads to easier compaction and, to a certain degree, allows cold weather paving and longer hauls. Pet stores market zeolites for use as filter additives in aquaria,  where they can be used to adsorb ammonia and other nitrogenous compounds. They must be used with some care, especially with delicate tropical corals that are sensitive to water chemistry and temperature. Due to the high affinity of some zeolites for calcium, they may be less effective in hard water and may deplete calcium. Zeolite filtration is also used in some marine aquaria to keep nutrient concentrations low for the benefit of corals adapted to nutrient-depleted waters. Adsorption is the adhesion of atoms, ions or molecules from a gas, liquid or dissolved solid to a surface. This process creates a film of the adsorbate on the surface of the adsorbent. This process differs from absorption, in which a fluid is dissolved by or permeates a liquid or solid, respectively. Adsorption is a surface phenomenon, while absorption involves the whole volume of the material. The term sorption encompasses both processes, while desorption is the reverse of it. Silica gel is an amorphous and porous form of silicon dioxide (silica), consisting of an irregular tridimensional framework of alternating silicon and oxygen atoms with nanometer-scale voids and pores. The voids may contain water or some other liquids, or may be filled by gas or vacuum. In the latter case, the material is properly called silica xerogel. 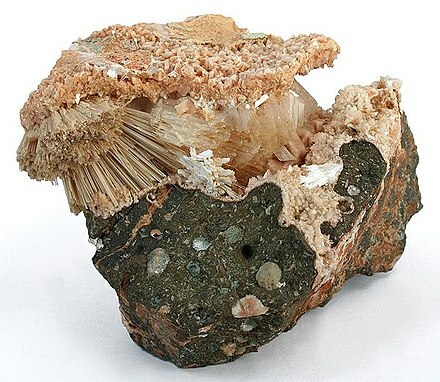 The ferrierite group of zeolite minerals (the FER structure) consists of three very similar species: ferrierite-Mg, ferrierite-Na, and ferrierite-K, based on the dominant cation in the A location. ferrierite-Mg and ferrierite-K are orthorhombic minerals and ferrierite-Na is monoclinic with highly variable cationic composition, (Na,K)2Mg(Si,Al)18O36(OH)·9H2O. Calcium and other ions are often also present. They are found in vitreous to pearly, often radiating, spherical aggregates of thin blade-shaped transparent to translucent crystals. A mesoporous material is a material containing pores with diameters between 2 and 50 nm, according to IUPAC nomenclature. For comparison, IUPAC defines microporous material as a material having pores smaller than 2 nm in diameter and macroporous material as a material having pores larger than 50 nm in diameter. Mordenite is a zeolite mineral with the chemical formula, (Ca, Na2, K2)Al2Si10O24·7H2O. According to Ullmann's Encyclopedia of Industrial Chemistry (2005), it is one of the six most abundant zeolites and is used commercially. Gmelinite-Na is one of the rarer zeolites but the most common member of the gmelinite series, gmelinite-Ca, gmelinite-K and gmelinite-Na. It is closely related to the very similar mineral chabazite. Gmelinite was named as a single species in 1825 after Christian Gottlob Gmelin (1792–1860) professor of chemistry and mineralogist from Tübingen, Germany, and in 1997 it was raised to the status of a series. Metal–organic frameworks (MOFs) are a class of compounds consisting of metal ions or clusters coordinated to organic ligands to form one-, two-, or three-dimensional structures. They are a subclass of coordination polymers, with the special feature that they are often porous. The organic ligands included are sometimes referred to as "struts", one example being 1,4-benzenedicarboxylic acid (BDC). Zeolitic imidazolate frameworks (ZIFs) are a class of metal-organic frameworks that are topologically isomorphic with zeolites. ZIFs are composed of tetrahedrally-coordinated transition metal ions connected by imidazolate linkers. Since the metal-imidazole-metal angle is similar to the 145° Si-O-Si angle in zeolites, ZIFs have zeolite-like topologies. As of 2010, 105 ZIF topologies have been reported in the literature. Due to their robust porosity, resistance to thermal changes, and chemical stability, ZIF’s are being investigated for applications such as carbon capture. ZSM-5, Zeolite Socony Mobil–5 (framework type MFI from ZSM-5 (five)), is an aluminosilicate zeolite belonging to the pentasil family of zeolites. Its chemical formula is NanAlnSi96–nO192·16H2O (0<n<27). Patented by Mobil Oil Company in 1975, it is widely used in the petroleum industry as a heterogeneous catalyst for hydrocarbon isomerization reactions. SSZ-13 (framework type code CHA) is an aluminosilicate zeolite mineral possessing 0.38 × 0.38 nm micropores. It belongs to the ABC-6 family of zeolites as well as offretite, cancrinite, erionite and other related minerals. The framework topology is the same as that of chabazite but SSZ-13 has high-silica composition with Si/Al > 5 which leads to low cation exchange capacity. The typical chemical formula of the unit cell can be described as QxNayAl2.4Si33.6O72•zH2O (1.4 < x <27)(0.7 < y < 4.3)(1 < z <7), where Q is N,N,N-1-trimethyladamantammonium. The material was patented by Chevron research Company in 1985, and has a potential use as a solid catalyst for the methanol-to-olefins (MTO) process and the selective catalytic reduction (SCR) of NOx. 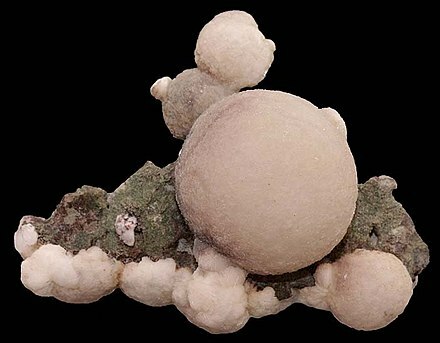 Faujasite is a mineral group in the zeolite family of silicate minerals. The group consists of faujasite-Na, faujasite-Mg and faujasite-Ca. They all share the same basic formula: (Na2,Ca,Mg)3.5[Al7Si17O48]·32(H2O) by varying the amounts of sodium, magnesium and calcium. It occurs as a rare mineral in several locations worldwide and is also synthesized industrially. Gonnardite is a comparatively rare, fibrous zeolite, natrolite subgroup. 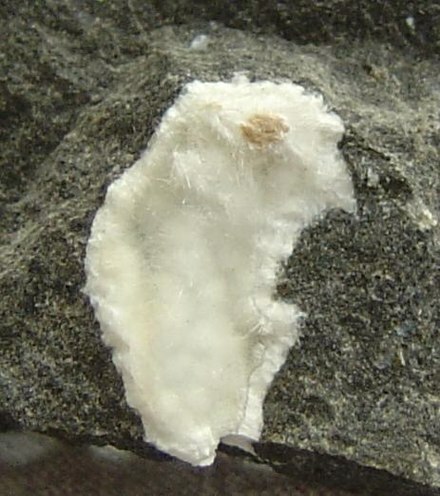 Older papers claim that a complete solid solution exists between tetranatrolite and gonnardite, but tetranatrolite was discredited as a separate species in 1999. A series, based on the disorder of the silicon-aluminum in the framework, appears to exist between Na-rich gonnardite and natrolite, Na2(Si3Al2)O10·2H2O. Mesoporous organosilica are a type of silica containing organic groups that give rise to mesoporosity. They exhibit pore size ranging from 2 nm - 50 nm, depending on the organic substituents. In contrast, zeolites exhibit pore sizes less than a nanometer. PMOs have potential applications as catalysts, adsorbents, trapping agents, drug delivery agents, stationary phases in chromatography and chemical sensors. The purpose of a mineralizer is to facilitate the transport of insoluble “nutrient” to a seed crystal by means of a reversible chemical reaction. Over time, the seed crystal accumulates the material that was once in the nutrient and grows. Mineralizers are additives that aid the solubilization of the nutrient solid. When used in small quantities, mineralizers function as catalysts. Typically, a more stable solid is crystallized from a solution that consists of a less stable solid and a solvent. The process is done by dissolution-precipitation or crystallization process. MCM-41 is a mesoporous material with a hierarchical structure from a family of silicate and alumosilicate solids that were first developed by researchers at Mobil Oil Corporation and that can be used as catalysts or catalyst supports. ↑ "Zeolite Structure". GRACE.com. W. R. Grace & Co. 2006. Archived from the original on 15 Feb 2009. Retrieved 8 Feb 2019. ↑ Cronstedt AF (1756). "Natural zeolite and minerals". Svenska Vetenskaps Akademiens Handlingar Stockholm. 17: 120. ↑ Breck DW (1973). Zeolite molecular sieves: structure, chemistry, and use. Wiley. ISBN 9780471099857. 1 2 "Database of Zeolite Structures". iza-structure.org. International Zeolite Association. 2017. Retrieved 8 Feb 2019. ↑ "Minerals Arranged by the New Dana Classification". webmineral.com. Retrieved 8 Feb 2019. ↑ "News from the Structure Commission". IZA Structure Commission. 2018. Retrieved 8 Feb 2018. ↑ Marakatti VS, Halgeri AB (2015). "Metal ion-exchanged zeolites as highly active solid acid catalysts for the green synthesis of glycerol carbonate from glycerol". RSC Adv. 5 (19): 14286–14293. doi:10.1039/C4RA16052E. ISSN 2046-2069. ↑ Marakatti VS, Halgeri AB, Shanbhag GV (2014). "Metal ion-exchanged zeolites as solid acid catalysts for the green synthesis of nopol from Prins reaction". Catal. Sci. Technol. 4 (11): 4065–4074. doi:10.1039/C4CY00596A. ISSN 2044-4761. ↑ Marakatti VS, Rao PV, Choudary NV, et al. (2014). "Influence of Alkaline Earth Cation Exchanged X-Zeolites Towards Ortho-Selectivity in Alkylation of Aromatics: Hard-Soft-Acid-Base Concept". Advanced Porous Materials. 2 (4): 221-229(9). doi:10.1166/apm.2014.1079. 1 2 Tschernich RW (1992). Zeolites of the World . Geoscience Press. ISBN 9780945005070. ↑ Rollmann LD, Valyocsik EW, Shannon RD (1995). "Zeolite Molecular Sieves". In Murphy DW, Interrante LV. Inorganic Syntheses: Nonmolecular Solids. 30. New York: Wiley & Sons. pp. 227–234. doi:10.1002/9780470132616.ch43. ISBN 9780470132616. ↑ "Zeolites (natural)" (PDF). USGS Mineral Commodity Summaries. 2011. Retrieved 8 Feb 2019. 1 2 Virta RL (2011). "2009 Minerals Yearbook - Zeolites" (PDF). USGS . Retrieved 8 Feb 2019. ↑ Earl DJ, Deem MW (2006). "Toward a Database of Hypothetical Zeolite Structures". Ind. Eng. Chem. Res. 45 (16): 5449–5454. doi:10.1021/ie0510728. ISSN 0888-5885. ↑ Szostak R (1998). Molecular Sieves - Principles of Synthesis and Identification. Van Nostrand Reinhold Electrical/Computer Science and Engineering Series. Springer. ISBN 9780751404807. ↑ Roth WJ, Nachtigall P, Morris RE, et al. (2013). "A family of zeolites with controlled pore size prepared using a top-down method". Nat. Chem. 5 (7): 628–633. doi:10.1038/nchem.1662. ISSN 1755-4330. ↑ Bhatia S (1989). Zeolite Catalysts: Principles and Applications. Boca Raton: CRC Press. ISBN 9780849356285. ↑ Nelson B (2018). "Add another strange property to the list of silver's bizarre traits". MNN . Narrative Content Group. Retrieved 9 Feb 2019. ↑ "On-Board Oxygen Generating System (OBOGS)". Honeywell.com. Honeywell International Inc. Archived from the original on 10 Sep 2011. Retrieved 9 Feb 2019. ↑ The Associated Press (16 Apr 2011). "Level of Radioactive Materials Rises Near Japan Plant". NYTimes . ISSN 0362-4331. ↑ "Compact and flexible thermal storage". Fraunhofer Research News. Fraunhofer-Gesellschaft. 1 Jun 2012. ↑ Ventura G, Risegari L (2007). The Art of Cryogenics: Low-Temperature Experimental Techniques. Elsevier. p. 17. ISBN 9780080444796. ↑ Dypayan J (2007). "Clinoptilolite – a promising pozzolan in concrete" (PDF). A New Look at an Old Pozzolan. 29th ICMA Conference. Quebec City, Canada: Construction Materials Consultants, Inc. pp. 168–206. Retrieved 7 Oct 2013. ↑ Andrejkovičová S, Ferraz E, Velosa AL, et al. (2012). "Air Lime Mortars with Incorporation of Sepiolite and Synthetic Zeolite Pellets" (PDF). Acta Geodynamica et Geomaterialia. 9 (1): 79–91. ↑ Ferraza E, Andrejkovičová S, Velosa AL, et al. (2014). "Synthetic zeolite pellets incorporated to air lime–metakaolin mortars: mechanical properties". Construction & Building Materials. 69: 243–252. doi:10.1016/j.conbuildmat.2014.07.030. ↑ Dietrich RV (2005). "Thomsonite". GemRocks. Retrieved 2 Oct 2013. ↑ Auerbach SM, Carrado KA, Dutta PK, eds. (2003). Handbook of Zeolite Science and Technology. Boca Raton: CRC Press. p. 16. ISBN 9780824740207. ↑ Rhee P, Brown C, Martin M, et al. (2008). "QuikClot use in trauma for hemorrhage control: case series of 103 documented uses". J. Trauma . 64 (4): 1093–9. doi:10.1097/TA.0b013e31812f6dbc. PMID 18404080. ↑ Rowe A (2018). "Nanoparticles Help Gauze Stop Gushing Wounds". Wired. Condé Nast. Retrieved 1 Nov 2013. ↑ Mumpton FA (1985). "Ch. VIII. Using Zeolites in Agriculture" (PDF). In Elfring C. Innovative Biological Technologies for Lesser Developed Countries. Washington, DC: US Congress, Office of Technology Assessment. LCCN 85600550. ↑ Hongting Z, Vance GF, Ganjegunte GK, et al. (2008). "Use of zeolites for treating natural gas co-produced waters in Wyoming, USA". Desalination. 228 (1–3): 263–276. doi:10.1016/j.desal.2007.08.014. ↑ "Database of Mineral Properties". IMA . Retrieved 9 Feb 2019. ↑ "Nickel-Strunz Classification - Primary Groups 10th ed". mindat.org. Retrieved 10 Feb 2019. ↑ First EL, Gounaris CE, Wei J, et al. (2011). "Computational characterization of zeolite porous networks: An automated approach". Phys. Chem. Chem. Phys. 13 (38): 17339–17358. doi:10.1039/C1CP21731C. PMID 21881655. This article incorporates public domain material from the United States Geological Survey document: "Zeolites" (PDF). Brobst DA, Pratt WP, eds. (1973). "Zeolites in Sedimentary Rocks". United States mineral resources. Professional Paper. 820. Washington, DC: USGS. doi:10.3133/pp820. Clifton RA (1987). Natural and Synthetic Zeolites. Information Circular, 9140. Pittsburgh: USBM. OCLC 14932428. Mumpton FA (1999). "La roca magica: Uses of natural zeolites in agriculture and industry". PNAS . 96 (7): 3463–3470. doi:10.1073/pnas.96.7.3463. PMC 34179 . PMID 10097058. Newsam JM (1992). "Zeolites". In Cheetham AK, Day P. Solid State Chemistry. 2. Clarendon Press. ISBN 9780198551669. Rhodes CJ (2007). "Zeolites: Physical Aspects and Environmental Applications". Annu. Rep. Progr. Chem. C . 103: 287–325. doi:10.1039/b605702k. Wikimedia Commons has media related to Zeolite . "Mineral structures with tetrahedral units"